Note: This article should not be used to diagnose or treat any condition. Please speak with a doctor before making health care decisions. Every parent knows the feeling of helplessness brought on by their sick child. You want more than anything to fix the problem and make them well, so you get them in the car and drive to the doctor’s office. After the paperwork and waiting, a nurse calls your name and leads you and your little one to an empty exam room, where you wait some more. The doctor then examines your child as you give a full history, explaining every cough, cry, and sneeze that you can remember. “Can’t you give us an antibiotic or something?” You just want to leave the doctor’s office with a solution to your child’s problem. “Sure. It’s called [insert long, complicated name of drug],” you hear as the doctor hands you a prescription. A sigh of relief. It’s a common experience that many of us have shared with our kids. Oftentimes, the medicine seems to work like magic; sometimes, it takes longer. But what if they didn’t even need that prescription in the first place? 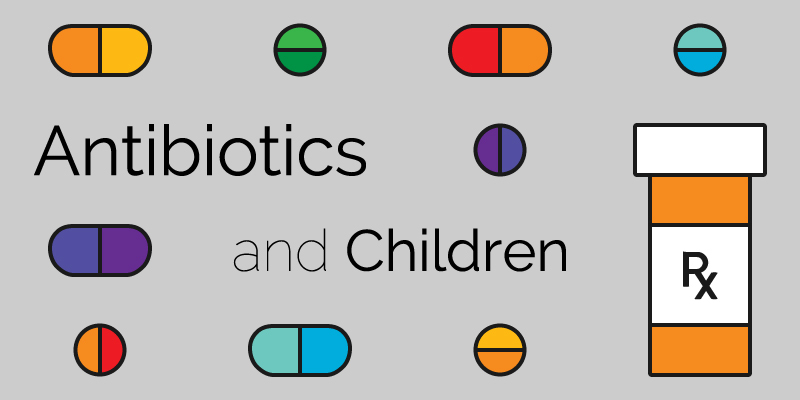 Do antibiotics and children go together? It’s in our nature as people to want proactive solutions to the problems we face, but the human body already has built-in responses to trauma and illness. Broken bones heal, and fevers break. It’s a great idea to know what the problem is — and you’ll often need to see a licensed health care professional to find out — but many of the most common ailments we experience can be relieved without pharmaceutical intervention. In fact, more than 11 million antibiotics prescribed each year to children and teenagers may be unnecessary, according to researchers from the University of Washington and Seattle Children’s Hospital. The researchers found that pediatricians prescribe antibiotics approximately twice as often as needed for ear and throat infections. This is because there are very few ways for doctors to distinguish between viruses and bacteria. Antibiotics are only effective for bacterial infections; they do not work on viruses. But without a clear diagnosis, antibiotics become the default solution. If antibiotics are good, why shouldn’t we use them more often? Many antibiotics have side effects like allergic reactions or fungal infections — some mild, others severe — but another problem arises when doctors over-prescribe antibiotics: bacterial resistance. Bacteria can become resistant to antibiotics that are used too frequently — or in patients not completely taking them as prescribed — thus preventing them from working to stop the infection. That’s why it’s important to only use these medicines when they’re needed, and why you should follow your prescription, even if you (or your children) feel better. Another common problem is that antibiotics don’t necessarily promote lymphatic, or lymph tissue, drainage. Without complete lymph drainage, bacteria can stick around and “restart” the infection. This doesn’t mean that all prescriptions are bad or that medical doctors are incompetent. Far from it. In the United States — and especially here in Nashville, TN — we have some of the best medical facilities and personnel in the world. They’re there for you in life-threatening situations. The key takeaway here is to ask lots of questions about any prescription or form of treatment. Ask about the side effects. Ask if the treatment is absolutely necessary. Ask if it could cause problems in the future. Many drugs treat something minor but can also set your body up for other health problems. For the everyday aches, pains, and sniffles, trust your doctor of chiropractic to boost your immune system with an adjustment. Your body (and your child’s body) has the awesome ability to heal itself, but stress, poor nutrition, and injuries can block your body’s natural healing powers. Chiropractic care can restore those capabilities. In addition to chiropractic care, a nutritional evaluation at Batson Chiropractic Group could go a long way in staying healthy. I’m a car guy, so here’s an automotive analogy: similar to the tune-up you get for your vehicle, my 27-point inspection allows me to evaluate the key organs and systems in your body and identify if something isn’t functioning the way it should. In most cases, we have a vitamin or supplement that can help resolve the issue. Call (615) 751-0958 today to schedule your next visit with one of our 5 chiropractors!